That is the essence of street food, known in Australia to be artisan-finger-fast food mostly sold in stalls at markets or special events rather than on the actual streets, as custom dictates. An outdoor habit that dates back into the mists of time and that we Italians, plus a huge, large slide of the world’s population, have had in our DNA all over the centuries. I’ll give you an example: Pompeii. If you have ever been there, I am sure you found yourself astonished by the beauty of this still well-preserved ancient city but… have you noticed the high number (hundreds) of thermopolia? What are they, you may ask. Well, thermopolia are considered forerunners of the modern fast-foods where extremely cheap ready-to-eat food was sold, especially to the poor whose humble houses lacked one important room, the kitchen. They represented a must-feature in ancient Rome, but similar on-the-move eating shops popped up in several other countries, each one distinguished by a particular food, and behind the food a specific story and tradition. In time of crisis street food could represent a valid alternative to expensive restaurants. However, it seems to be one of the latest trends for food lovers and chefs travelling every corner of the globe to re-discover local humble dishes and transform them into a unique delicatessen. A few years ago VirtualTourist.com, one of the main travel community websites in the world, compiled a list of the “Top Ten Best Street Food Cities”, ranking Palermo as number 5 among the world’s top destinations and crowning it as the European Capital of Street Food, cibo da strada. A good score for this vibrant town where grazing in the streets is a centuries old tradition and expression of a proud community. 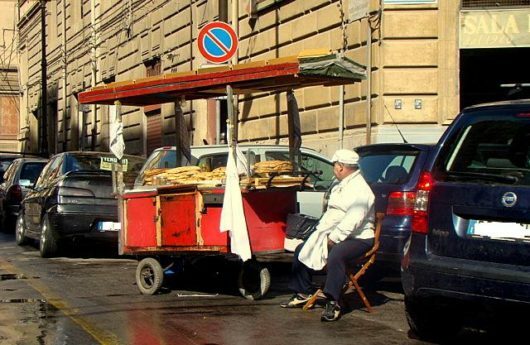 In Palermo an array of street food hawkers with minimal toolkit are scattered all over the city, especially near the most popular and oldest markets such as Vucciria, Ballarò and Capo, just to name a few. To better understand the variety of food you can find in Palermo, we met Maurizio Spallina, a Sicilian deli expert and chef in one of the most popular restaurants in Melbourne. Maurizio started his career as chef driven by a true passion for food that led him to work in almost every European capital, until reaching the Australian shores two years ago. “As soon as I finish the military service I moved to London to work in a restaurant. In only a couple of weeks the boss promoted me from dishwasher to commis chef”. A meteoric rise for Maurizio who, still very young, went back to Palermo after a few months in England to open his first rosticceria (deli). Yet in Melbourne, the foodie city par excellence, where multiculturalism widely expresses itself through an endless variety of Moorish flavours, the authentic Sicilian deli is nowhere to be seen, except for the arancini, and one of Maurizio’s desires is propagating and sharing his passion in Australia, and who better than him? He has enough experience, skills, love and energy to spread the culture of the Sicilian rosticceria in a foreign land. As he explains, “Sicilian street food consists of many different deep-fried or oven-baked finger food specialties where the use of a special puff pastry is the basic criterion”. Puff pastry, in Italian “pasta sfoglia”, is a half sweet half-savoury soft and elastic dough made combining sugar, salt, flour, water, and pork lard. What makes the difference is the way it is shaped and filled. Here’s a little sampling of the pieces typically available curbside in Palermo (and that will make you hungry): sfincione, a thick Sicilian pizza, topped with tomatoes, onions, anchovies, and caciocavallo cheese, seasoned with a dash of oregano; pizzotto, a round-shaped pizza-like topped with tomato sauce and cheese with ham and mozzarella as filling; spiedini, deep-fried rectangular sandwiches stuffed with ragù, and mattonella, a baked brick-shaped pizza usually filled with tomato sauce and mozzarella and topped with sesame seeds. “Palermo cuisine is the reflection of the foods introduced in the island over the centuries by Greeks, Romans, Arabs, Spanish, French… The connection to tradition is so strong that changing ingredients and methods is forbidden. Creativity and variations are welcomed but some recipes must remain the same to guarantee quality and authenticity”.